We Guarantee You Will Pass Organic Chemistry! Everyone Passes! We Guarantee It. For years, students have been getting weeded out of their dreams by the most dreaded course, "Organic Chemistry". Our program was designed by previous students, who are now doctors that have found an easier way for you study, pass and in most cases excel. 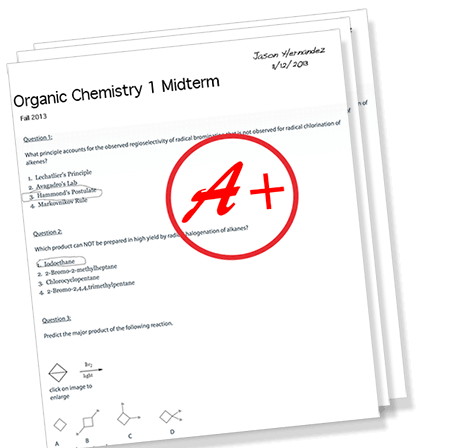 We guarantee you pass Organic Chemistry! So, what is our guarantee? We are so confident in our program that we offer a guarantee like no other. We guarantee you will pass! While many students are happy with just passing this course, most of the students that we have feedback from, have excelled to be in the top of their class. This is important for those that are applying to medical schools. By using our program as a companion to your class lectures, you will have a great understanding of the subject and be well prepared for all your quizzes and exams. You will learn this challenging subject easier than your classmates who are not using our program. We guarantee you will pass or we will provide you a complete refund. So try our program risk-free! You have everything to gain.